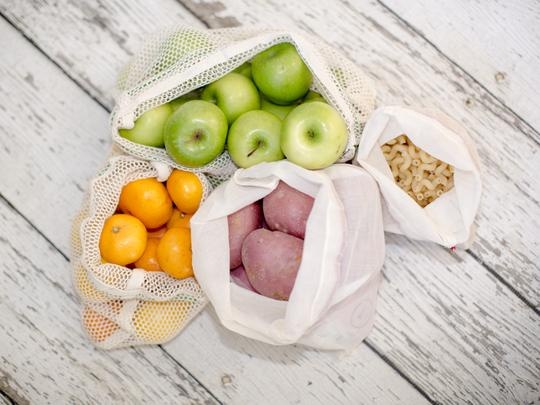 My Vita Bag fresh produce bags are your sustainable and practical solution to plastic bags , you can use and reuse these bags at the grocery store or farmers markets. When deciding to reduce the amount of waste you generate be sure to choose a sustainable product that can be reused, and will biodegrade naturally. This pack contains 2 large (28 cm x 33 cm ) / 2 small (20 cm x 25 cm) reusable fresh produce bags ethically made from 100% certified organic cotton designed to last you a few years. Two Mesh bags, ideal for storing peelable produce mainly fruit. By using and reusing My Vita Bags pack of four, you will have saved more than 208 disposable plastic bags from ending up in landfill each year! Care: Machine or hand wash in cold water. Line dry. Note: Since this product is made from 100% undyed and unbleached natural cotton, please allow reasonable tolerance for shrinkage.